Nelson Ledges Road Course was constructed in 1958 on a small rural potato farm outside of Warren, Ohio. There was no design plan, no million-dollar study, and no million-dollar contracts with architects, engineers or planners. It was two men (Marvin Drucker and John McGill) and a bulldozer with an idea to build a race track. The original track was dirt and only 1 mile in length. Paving came next and then the addition of “The Carousel” in 1962. Later the bridge was added, the pit lane was extended and paved, and the tires were added for barriers around the track. It is considered one of, if not, the fastest tracks in the country. 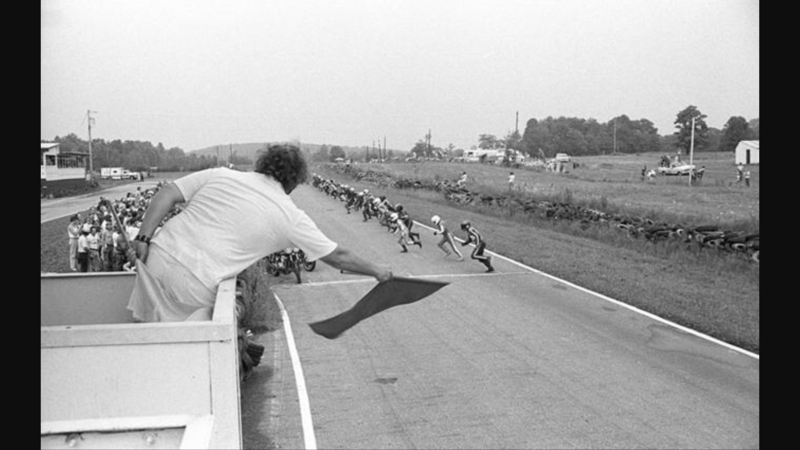 In 1968, the idea of the 24 Hours of Nelson Ledges became a reality for motorcycle teams to battle a 24-hour race alike the cars. The 24 Hours of Nelson Ledges was the only continuous 24-hour motorcycle race in the United States at its time. The race was famous for running the Le Mans style start. Nelson Ledges Road Course also hosted two large concerts in the mid 70’s that included the Steve Miller Band, Heart, Widow Maker, Electric Light Festival, and Van Morrison. SCCA’s Trans Am series made 3 annual visits to the track in 1975, 1976 and 1977. John Greenwood, George Follmer, and Bob Hagestad won these prestigious events with the likes of Peter Gregg, Hurley Haywood, Bob Tullius, and Al Holbert in quick chase. A couple years later, John McGill, Grover Griggs, Ann McHugh, and a whole slew of other instigators had a crazy idea to hold a 24-hour race for purely showroom stock vehicles. Hence, the Longest Day of Nelson was conceived in 1980. The list of competitors over the next 16 years reads like a who’s who of North American motorsports. Hurley Haywood would return. John Greenwood would return. John Heinricy, Andy Pilgrim, The Archer brothers, John and Jeff Andretti, Parker Johnstone, Price Cobb, Mark Dismore, Janet Guthrie, Danny Sullivan, and the Nonnamaker family all put in a lot of laps at night around this track. Micheal Andretti went to his SCCA driver’s school here as well as Peter Cunningham and Micheal Galati. Also, Nelson is not absent of celebrity appearances. John Oates (of Hall and Oates) Tom Cruise, and even Steve McQueen have made appearances behind the wheel here. But Nelson is most revered by the visits from Paul Newman. Many people can remember many evenings after the racing was done for the day, the spectators were gone for the evening, and the beer was being swilled. This was when Mr. Newman himself would come join the communal campfire with the workers, racers and officials. Nelson Ledges is one of the very few of its kind left in the country. Most tracks today have changed and lost their original character. It’s a herald back to classic race tracks not cookie cutter designs that we see today. Bridgehampton, Stardust, and Meadowdale are long since gone but Nelson has remained Nelson, and will continue to be a Nelson forever.